The soul of a book should ideally be seen (or sensed) in its cover. Illuminating the soul is not a simple or easy thing to do. As such, creating the cover is not something done in a moment, even if the final design may result from a brief spark of creativity. As with the page design, the first step towards designing a cover may be to prepare a design brief. This depends on how formalized the design process is. At NIAS Press, for instance, cover ideas are discussed and tried out in consultation with different Press staff and (especially) the author. Because it is a small press at which many publishing functions are undertaken in-house, both initiating and producing the cover is done by one person, and he knows what is required. The design process, then, is quite informal and any design brief largely internalized; any extra considerations are simply handled informally. At larger (or richer) presses, the design process is likely to be more formalized. Usually a professional designer will produce the cover but it is the production editor (ideally with the author’s input) who will provide a design brief to sketch out ideas and elements to be included in the design. Over and above the inclusion of cover elements, decisions need to be made on some other issues, among them the following. What design is appropriate? Readership matters. Some time ago, we published a book about feisty Muslim women in a certain Asian country. Though Asian in its subject, the book had a very nice, subdued, Nordic-looking cover. This ‘Nordic’ cover worked fine in Europe and the States but feedback I received from the Asian country was that there would have been far greater local interest in the book if its cover had been equally feisty, tinged with local flavours. Full colour or not? Technically, there is no reason today to restrict the use of colour on your book cover. A decade ago, it was far cheaper to print two-colour covers but that is not the situation today with modern printing presses. The two-colour mentality still seems to persist with certain publishers today but I may be wrong here. It may be instead that branding reasons are behind the restriction on the range of colours used; that is a different matter. And what colour? Some factors may limit what colours can be chosen, e.g. a series template or physical restrictions (for example, large areas of solid black on a cover is not favoured in Asia where the sweaty hands of browsing customers can quickly ruin the appearance of a book before it has even been sold). On the other hand, cultural considerations may encourage the use of certain colours (or colour ‘moods’) over others, as should have been the case with the above-mentioned book about feisty Muslim women. Illustration or not? A good illustration can transform a cover and dramatically increase the appeal of a book; a bad one can cause the book to look amateurish and unappealing. It is amazing how awful the covers of some publishers are. Cover text. It is not enough to produce text for the front and back cover, spine and (for jackets) the inside flaps. All of these text blocks need to be designed, shaped to fit the location. Good design is more than a matter of taste. Even so, it is amazing how different people’s tastes and perceptions are (as so clearly illustrated for me recently in the cover design for our above-mentioned book on the Thai monarchy), and how these can impact on a design – for better and for worse. As such, there is likely to be a fair amount of consultation (and argument) over the design brief and any cover sketches. But at a certain point, however, eventually a draft cover (or several alternatives) will be created and passed round for comment. I suspect it is extremely rare for a cover draft to be accepted as is. After all, covers are like bicycle sheds: something ordinary and about which everyone can safely express an opinion. Eventually, however, a decision will be made about the cover though this may be (as in the case of our Thai monarchy book) to go with a temporary cover until something better can be agreed on. 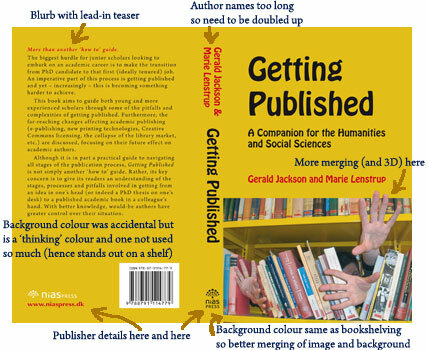 If it is only at this point that you, the author, become involved in the cover design, then you’ve got problems. But more about that in my next post.